Rossvale bowed out of the Scottish Junior Cup on Saturday - but only after pushing last season’s runners-up all the way in a seven goal thriller. 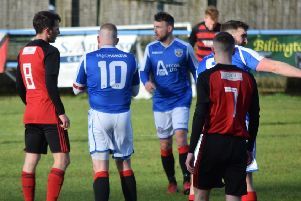 Ayrshire side Hurlford United edged past Gordon Moffat’s side 4-3 in a fifth round replay to book a quarter-final tie with Clydebank. But they had to survive a storming second half fightback from Rossvale to get there. Rossvale got off to the worst possible start at Blair Park by conceding a goal after only three minutes. A cross ball was missed by everyone in front of goal and Paul McKenzie was left with a simple tap-in for Hurlford’s opener. Play was frantic and it was end to end stuff but the Vale went two down on 16 minutes as, again, uncharacteristic defensive frailties cost the Bishopbriggs side and Ryan Caddis doubled the home side’s advantage. But if the current Premiership leaders thought they were going to stroll into the last eight they were soon made to think again as Vale clawed their way back into the. 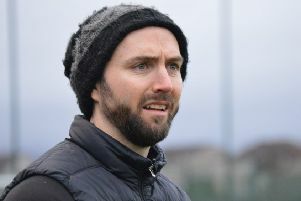 Liam McGonigle picked the ball up midway inside the Hurlford half, ran at the defence and unleashed an unstoppable 25- yard shot high into the net. It was now game on with both sides evenly contesting, but on 38 minutes Hurlford went 3-1 up when a corner was not defended and the ball squirmed over Jamie Donnelly into the net. Boss Moffat’s half-time team talk seemed to inspire Vale as they looked comfortable - until the 65th minute when again indecision at the back resulted in Liam Caddis grabbing a fourth for Hurlford. Vale made three substitutions, bringing on Stephen McGladrigan, Jamie Hunter and Peter Bradley and this gave the Bishopbriggs side more energy. With Hurlford seemingly backtracking as it was all Vale now and on 79 minutes Hurlford’s McKenzie was shown a red card after kicking the ball away to waste time. The tie then exploded as McGonigle turned to blast a shot into the net and, with the former winners pinned deep in their own half, curled a free-kick over the wall and into the net to complete his hat-trick. Hurlford were clinging on but time unfortunately ran out for Rossvale.